This is your star reporter Hugh Manatee, checking in with the latest from our luxuriously sun-kissed abode on the beach. I’m pretty well connected here at Sirenian Bay, which is why I think it’s “high tide” that I bring you an exclusive interview with two of my favorite people – Brenda and Brian Montgomery. Brenda and Brian don’t need much of an introduction, but here’s one anyway. They’re the generous and delightful souls who took Manatee Villa (originally known as Casa Sunsandsea) from daydream to dream home – and then grew it into Sirenian Bay Resort & Villas. They love everything about Placencia, Belize and the laid-back seaside life – almost as much as they love sharing it with guests. “We just want everyone to have fun,” adds Brenda, who loves taking guests over to the village for a spot of shopping – or finding an excuse to head to the beach. Brian prefers to steer them towards Monkey River for an adventure-filled day with guide Percy, or towards other heart-pounding activities. Both shopping and zooming over the river work up an appetite, and Brian and Brenda have plenty of local recommendations for hungry guests. Dessert, of course, is always at Tutti Frutti. “I’m still trying all the flavors, but Peanut Butter is in most of my combinations,” says Brian. These are the kinds of difficult decisions that you have to make when you live in Placencia. Another difficult decision: how best to spend a day in paradise. 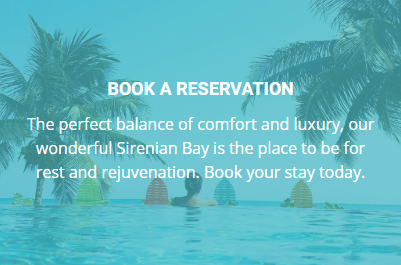 Relaxation is a big part of the culture here, and Brian and Brenda have built it into the whole Sirenian Bay experience. “We just want you to come and enjoy a totally relaxed environment that feels like you’re with family at your second home, all while enjoying the experiences of Belize,” says Brian. That’s assuming, of course, that you don’t just to decide to “seas the day” and move here full-time! Let’s get wild: wildlife spotting around Placencia It’s summertime and the weather’s fine!